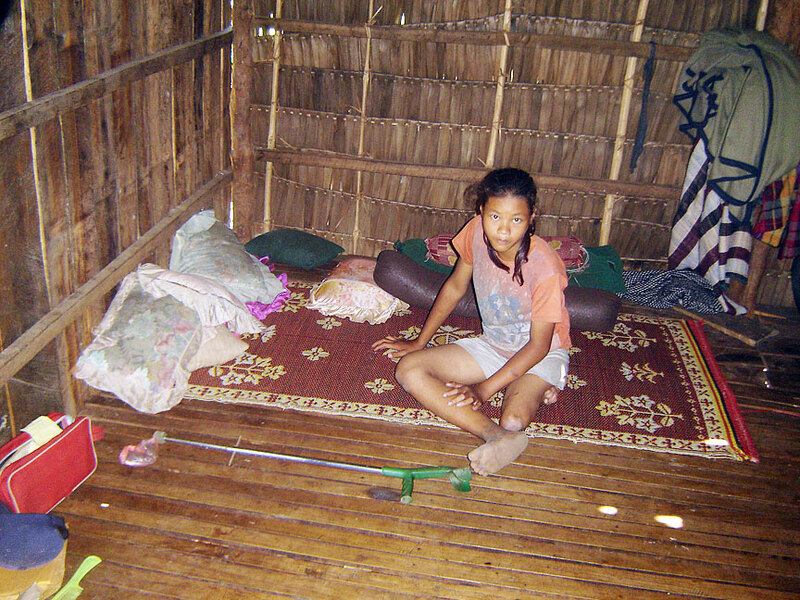 ANLONG THOR, Cambodia » To get into her wooden hut built on stilts in this rural village, Sythan Leam puts her crutch aside and scampers up the ladder-like steps using her arms, her good leg and the stump at the knee where her left foot is fused to her thigh. When she was an infant, an oil lamp tipped onto her blanket, causing a fire that severely burned her leg. There are no doctors where she lives, so the wound never healed properly and Leam, now 14, has never been able to fully extend her leg to walk normally. Other children, even her own brothers and sisters, call her "haiquai," or clubfoot. As early as this week, Leam is expected to travel more than 6,300 miles from her village in Kampong Thom Province in Cambodia to Shriner's Hospital for Children in Honolulu, where doctors will see if they can help her walk for the first time in her young life. Medicorps, a Hawaii-based charity, is trying to raise about $8,000 to $10,000 to cover the cost of flying Leam to Hawaii and some other expenses. Shriner's will treat her for free if she can get to Honolulu. So far, about $5,500 has been raised, said Dr. Gunther Hintz, president and founder of Medicorps. But, if necessary, Hintz said, he will dip into his own pocket to cover the rest of the cost. Because Leam's leg hasn't developed properly, the surgery will be complex, and part of her leg might have to be amputated, Hintz said. 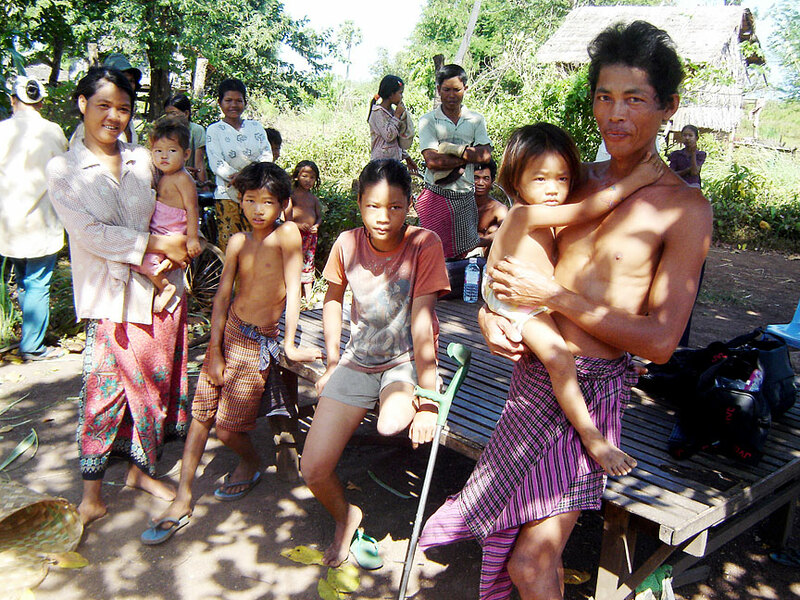 But even a prosthetic leg, he said, will give Leam a chance at a better life. Hintz is in Cambodia now arranging for Leam's passport and visa. In November, the Star-Bulletin traveled with Medicorps workers to Leam's village about 80 miles northwest of Phnom Penh. There are more cattle than people on the bumpy dirt road leading to Anlong Thor. A school is nearby, but Leam hasn't attended classes since the second grade. In many poor farming families, education is a luxury. Instead of school, Leam helps raise her younger brother and three sisters, and does chores like cooking rice. There's no electricity and they have to walk to get water from a village well. Medical care is not an option for a poor rural family like Leam's, said Laurent Lek Ramonith, the country director for Medicorps. That's why Leam hadn't seen a doctor until just two years ago. By chance, an aid worker for a group that helps land-mine victims saw Sythan hopping along a road and was able to get her to the Angkor Hospital for Children in Siem Reap, about 130 miles away, where her case came to the attention of Heinz. It was the first time she had been out of her village. Coming to Hawaii will be an even greater culture shock. Hintz said coming to Hono-lulu will change Leam. Shriner's has a program to teach children how to speak, read and write English, and she'll live with a local Cambodian family when she's an outpatient. Leam said she would like to be a teacher one day, a prospect that seems unlikely if she stays in her village with her handicap. Asked if she will miss her parents and four brothers and sisters, Leam puts on a brave face. She doesn't really know where Hawaii is or what to expect. "She wants to walk normally," her mother, Teartear, said. And all Leam knows about the trip that could change her life is that there's a chance to fix her leg. See how a 14-year-old Cambodian girl's life will change when she comes to Hawaii for treatment at the Shriner's Hospital for Children. At 5 and 10 p.m. Tomorrow: In the Honolulu Star-Bulletin and on KITV4 Island Television News at 6 p.m., an update on Sok Ouey, a Cambodian boy who was treated at Shriner's five years ago after his legs were nearly blown off by a land mine. Tuesday: In the Honolulu Star-Bulletin and on KITV4 Island Television News at 6 p.m., how Medicorps, a Honolulu charity, is helping to improve medical care in Cambodia.